(Minghui.org) Falun Gong has been banned in China for 17 years, and a large number of practitioners have been arrested, detained, and tortured for their belief in the practice. This peaceful meditation practice has been well-received for years in over 100 countries outside of China. Li Yunxiang, also known as Leon Lee, is the director of the film, which won a Peabody Award early last year. Guang Ming Daily, a major Chinese newspaper in Malaysia, recently published an article on forced organ harvesting. This brutality has drawn increased attention. The United States House of Representatives unanimously passed House Resolution 343 on June 13, 2016, condemning the atrocity, and urging further efforts by the U.S. Government. One week later, on June 22, three independent investigators provided more evidence confirming the existence and magnitude of forced organ harvesting in China. The findings of the renowned experts, David Kilgour, David Matas, and Ethan Gutmann, show that about 100,000 transplants are performed in China every year. Therefore the number of organs forcibly harvested from Falun Gong practitioners may have reached more than one million through the years. (Minghui.org) Falun Gong (also known as Falun Dafa) practitioners in Malaysia participated in the 2016 Royal Floria Putrajaya, a very popular flower and garden festival, from May 27 to June 4. The Falun Gong Divine Land Marching Band performed on May 29 and received warm feedback. Many people took pictures with the band. The Divine Land Marching Band performs at the 2016 Royal Floria Putrajaya on May 29, 2016. Sponsored by Perbadanan Putrajaya (the local governing authority) and cosponsored by the Federal Territories Ministry and the Ministry of Tourism and Culture Malaysia, there were more than 300 activities and performances at the Royal Floria Putrajava this year. The Divine Land Marching Band’s powerful music impressed the audience. Zamsari from Kuala Lumpur praised the band. Zamsari from Kuala Lumpur was happy to see the band, commenting, “Great! Super!” Wan Zaili from Johor said the band’s music gave the event a sense of grandeur. (Minghui.org) With Chinese descendants representing nearly a quarter of its population, Malaysia is closely connected with China, both culturally and economically. Between the recent Chinese New Year on February 8 and the Lantern Festival (15th of January on the lunar calendar), Falun Dafa practitioners held three parades in Malaysia. Many learned about the peaceful meditation practice and the severe suppression of Falun Dafa in China. Two of the parades took place in Selangor, the most developed and populated state in Malaysia: one was in Mahkota Cheras on February 14, and the other took place in Semenyih on February 21. A third parade was held on February 20 in Setia Indah, a suburban town of the nation’s second largest city, Johor Bahru. Impressed by the dragon dance team, heavenly maidens, and waist drummers, systems engineer Chandra said he was very fortunate to see the march. “I was taking my son to a soccer game and did not expect to come across such a great parade here,” he said, adding that the performers’ traditional costumes and positive energy were very pure. Upon hearing that thousands of practitioners had lost their lives as a result of torture in police custody, Mr. Gong said he was sorry to hear about the suppression. “The parade by your group is very well done, indeed,” he added. The man’s attitude was still cold, but when Jessica told him about the regime’s harvesting of organs from living Falun Dafa practitioners detained or imprisoned for their faith, he went silent. Later, he took some materials and a copy of the book Nine Commentaries on the Communist Party. Ms. Chen, another practitioner who attended the event, said she found that many residents had been misled by the CCP’s propaganda. “I know I have to tell them what Falun Dafa is, how good it is, why the CCP persecutes practitioners, and the consequences of the suppression,” she said. More than 200,000 people have filed criminal complaints in China against former leader Jiang Zemin for ordering the violent persecution of Falun Dafa. Some residents also signed petitions during the parades to support this initiative. Spectators sign petitions calling for the prosecution of former Chinese leader Jiang Zemin, who initiated the communist regime’s bloody campaign against Falun Dafa in China. (Minghui.org) The Divine Land Marching Band in Malaysia performed in a well-known tourist destination, the historical city of Malacca, on January 30, 2016, to welcome the coming of Chinese New Year. The band, consisting of Falun Gong practitioners, performed from a double-deck bus on main streets and at scenic sites. They brought the jubilant atmosphere and the grace of Falun Dafa to local people and tourists. Both sides of the double-deck bus displayed large banners, reading, “Falun Dafa is Good.” The bus proceeded from the Melaka Sentral Terminal along the route to scenic sites. The band performance was welcomed wherever it was heard. Divine Land Marching Band performs at the Stadthuys, a well-known scenic site. Divine Land Marching Band performs at the Melaka Sentral Terminal. Passengers waiting for busses watch the performance. Mohd Khairi, a member of a military marching band in Malaysia, was excited to watch the performance of The Divine Land Marching Band at Jonker Walk. Besides Jonker Walk, the band also performed at other scenic sites, including The Stadthuys, Menara Taming Sari, and others. Chinese Tourist: We Know Falun Dafa Is Good. Chinese tourists are happy to see the band perform on the Stadthuys and take photos. The band performed on the double-deck bus at the Stadthuys. Chinese tourists there were happy to see the performance, and many took photos. A practitioner distributed information materials to them. One tourist said excitedly, “You can perform here!” Practitioner Su said, “Falun Gong practice is allowed here.” She asked the tourist, “Do you know that Falun Dafa is good?” The tourist replied, “We knew it a long time ago.” He continued taking photos of the band. Kasim and his wife read a Falun Gong newspaper. Three students, Anis, Nadiatul, and Nurul, were waiting for bus together at Melaka Sentral Terminal. A practitioner told them about Falun Gong, the persecution in China, and the CCP’s live organ harvesting. Anis, Nadiatul, and Nurul sign a petition to support lawsuits against Jiang. They were sympathetic for the Falun Gong practitioners who have been tortured, but grateful to the practitioner who told them the facts. They said they wished the persecution will end as soon as possible. They all signed the petition to support the lawsuits against Jiang without hesitation. (Minghui.org) Malaysia Falun Dafa practitioners participated in the 2015 Taiping Peace Festival on September 20, 2015. They held “The Art of Zhen-Shan-Ren (Truth-Compassion-Forbearance) International Exhibition” and a signature drive to help end the persecution in China. Taiping means “peace” in Chinese and was given that name by the British colonial government aiming to end bitter feuds between different groups of Chinese immigrant mine workers in the 1870’s. More than 2,000 citizens and many community leaders attended the this year’s Taiping Peace Festival. Many festival goers showed support for Falun Dafa by signing petitions condemning forced organ harvesting in China and supporting the recent wave of lawsuits against former Chinese dictator Jiang Zemin for launching the brutal persecution of Falun Gong. The band was invited to play Malaysia’s national anthem at the opening ceremony. Zhen-Shan-Ren translates to Truthfulness-Compassion-Forbearance, which are the main principles of Falun Dafa. The exhibition showcases the beauty of Falun Dafa and also depicts the plight of practitioners amidst the ongoing persecution in China. The petitions call for the end of forced organ harvesting in China and the reporting of Jiang Zemin’s crimes to the Supreme People’s Court in China. Mr. Athimulam Arjunan, president of the Service Civil International Malaysia, Penang Chapter, signed the petition that called for an end to the forced organ harvesting in China. “I wish nothing like this would happen in the world. But it happened and continues to happen in China. I am very sad to hear about it,” said Mr. Arjunan. Ms. Oon, an English teacher, said that no one should face torture, abuse and harassment. “Forced organ harvesting is cruel and must be stopped immediately,” she said. Two sisters, Shahira and Shafika signed the petition supporting the lawsuits against Jiang Zemin. They said that they were very surprised to hear that the Chinese Communist Party (CCP) was so cruel. They agreed with each other that Jiang Zemin, former head of the Chinese Communist regime, who is responsible for the persecution and organ harvesting, must be taken to court. The couple was shocked to hear about the state-sanctioned organ harvesting and trafficking crime in China and would definitely share the information with their friends. (Minghui.org) The Divine Land Marching Band in Malaysia, consisting of 40 local Falun Gong practitioners, participated in the Independence Day parade in Selangor, Malaysia, on August 31, 2015, which marks the 58th anniversary of the nation’s independence. The Falun Gong entry won the “Best Marching Band” award. The band passing by the VIP stage. Mohamed Azmin Ali, the Menteri Besar of Selangor, issues the award to Falun Gong practitioners. Sixty-one groups from each level of the government in Selangor, public schools, and non-government associations performed at the parade. Selangor is the most populated state in Malaysia, and is the home of Kuala Lumpur International Airport and Port Klang—the largest port in the country. (Minghui.org) On July 10, 2012, the Transplantation Unit of the Medical Development Division of Malaysia and the Malaysian Society of Transplantation held a workshop on “The Realities and Risks of Organ Trafficking.” David Matas, a well-known human rights lawyer in Canada, a 2010 Nobel peace prize nominee, and one of the authors of Bloody Harvest, was invited as the only keynote speaker. The workshop was enthusiastically supported by the medical community. At 11:30 a.m., more than 100 local medical experts, doctors, nurses, and lawyers concerned about medical ethics attended the workshop at Malaysia Medical College. The conference room was full, and the hosting organization had to add temporary seating. In his presentation that took more than an hour, Mr. Matas put forward 14 principles that organ transplantation organizations in every country should follow. He emphasized the brutality of Chinese organ trafficking, especially the heinous fact that the entire country has participated in organ harvesting from living Falun Gong practitioners, which is different from underground organ trafficking in other countries. In his opinion, however critical a patient’s condition is, one should not sacrifice another person’s life for his or her organs. According to his presentation, since 1999, China has become the biggest organ transplantation country in the world. Many patients from other countries have gone to China to get new kidneys, livers, or hearts. He said these organs were harvested from living Falun Gong practitioners. Mr. Matas presented 14 suggestions to the Malaysian government and medical community to help stop the CCP’s crime of live organ harvesting. The suggestions included: not sending any patients to China for organ transplants, refusing to train Chinese medical doctors in organ transplantation, refusing to publish papers that report on using death-row inmates for organ transplantation, denying medical professionals involved in organ trafficking membership in The Transplantation Society, having the Ministry of Foreign Affairs in each country advise tourists not to get organ transplants in China, and not providing health insurance to those patients that go to China for organ transplants. Mr. Matas pointed out that, since the publication of “Report into Allegations of Organ Harvesting of Falun Gong Practitioners in China” in 2006, many countries have set forth some policies to stop organ trafficking. For example, Australia no longer trains Chinese organ transplantation doctors and Israel does not insure those patients who go to China for organ transplants. Such decisions were based on the investigation report. In addition, the Taiwan government banned organ trafficking. In concluding he said that he had learned that Malaysia is attempting to establish a code to stop organ trafficking. If successful, Malaysia would be a leader in this effort. Three experts in organ transplantation in Malaysia agreed that patients that go to other countries for organ transplantation violate medical ethics and encourage organ trafficking, which should be stopped. Datuk Dr. Harjit Singh, President of the Malaysian Society of Transplantation, pointed out at a press conference that a responsible person would stop patients involved in illegal organ transplantation. Such illegal transactions focus on profit but not the patient’s health. Datuk Dr. Ghazali Ahmad, Senior Consultant and Head, Department of Nephrology, Hospital of Kuala Lumpur, disclosed that the government knew about the occurrence of illegal organ transplantation and that, beginning in 2012, the Medical Development Division no longer provides medicines for patients that go to other countries for organ transplants. Falun Gong, also known as Falun Dafa, is a traditional Chinese spiritual discipline for mind and body. The practice involves slow, gentle movements and meditation. It is easy to learn, enjoyable to practice, and free of charge. Its principles are based on Truthfulness-Compassion-Forbearance. The practice began in China in 1992 and quickly spread by word of mouth throughout China and then beyond. Its beneficial effects in uplifting an individual’s physical health, spiritual wellbeing, and moral character, not to mention its positive influence in the community and society as a whole, have been undeniable. In fact, Falun Gong is practiced by over 100 million people in over 100 countries. The main works of Falun Gong are available in over 30 languages. On July 20, 1999, the Chinese Communist Party (CCP) launched a brutal persecution of Falun Gong. 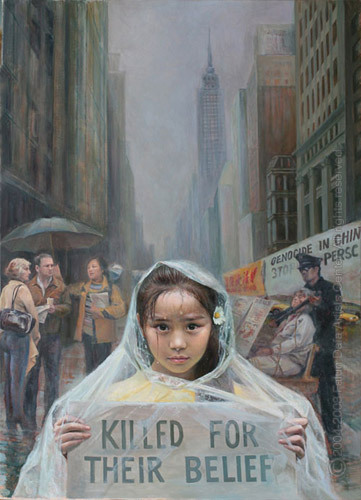 Since the start of the persecution, Falun Gong practitioners throughout the world have been constantly speaking out about the truth of Falun Gong and exposing the CCP’s crimes in a tireless effort to end the persecution. For several years, Mr. Matas and Mr. Kilgour toured more than 80 cities in over 40 countries to expose the CCP’s atrocities of organ harvesting from living Falun Gong practitioners in hopes of stopping such crimes. Mr. Matas graduated from Princeton University and the University of Oxford. He has made outstanding contributions in human rights, immigration, and refugee issues. He received the Order of Canada on December 30, 2008, the highest honor from the Canadian government. He was nominated for the Nobel Peace Prize in 2010 for exposing CCP’s atrocity of live organ harvesting.